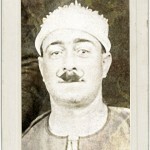 Munîra al-Mahdiyya was a legendary name in Egypt. In spite of her fame, we know little about the life of the “Sultânat al-tarab”. Probably born in Zaqâzîq, Zakiyya Mansûr Gânim or Zakiyya Hassan, sang already in the Azbakiyya cabarets stages in the early years of the 20th century and made her first records in 1906 as Sett Munîra (Madam Munîra). She was one of the relatively few women producing commercial recordings before WW1. Munîra mastered a learned repertoire. When she was invited for private concerts, she sang adwar and qasâ ‘id for men, and reserved the taqtuqa for women or the public audiences of the theaters. She joined the troupe headed by Salâma Higazi and, after the onset of Higazi’s last illness, she sang the role that had been written for him in “Salâh al – Din al-Ayyûbî”. 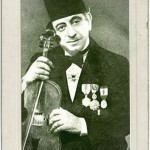 This is how, disguised as a man, she was the first Egyptian Muslim woman to perform on stages. Her success pinnacled in January 1927 with the presentation of “Kilyûbatrâ wa Mârk Antuwân” (Cléopatre and Marc Antoine) with Muhammad Abd al-Wahhâb. She formed and managed her own company for over ten years and performed new roles written especially for her including Arabic adaptations of Tosca, Carmen, and Madame Butterfly. Her company frequently performed nationalistic songs that were summarily censored by the British, giving rise to the slogan “Hawa l Hurriya fi masrh Munîra al Mahdiyya” (there is an air of freedom in the theater of Munîra al Mahdiyya). 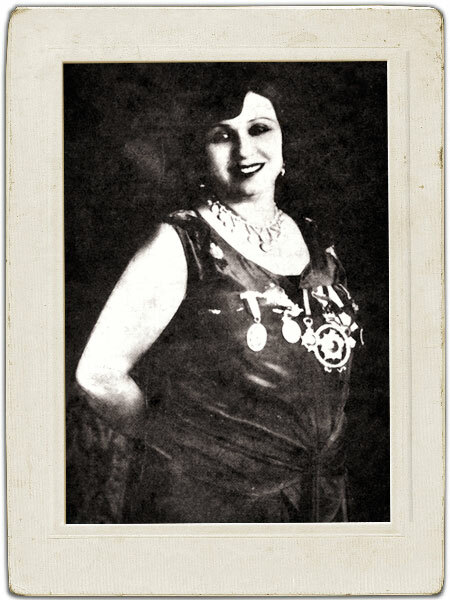 An independent and famous woman, in 1926 Munîra even received a medal from the Ministry of Public Works for services rendered to the revival of Arab singing. Munîra’s career is exemplary; she is only the most famous of a multitude of cabaret artists of the theatrical scene during the 1920s. Following her, the nieces of the ̕alma Bamba Kashar, Fathiyya and Ratîba Ahmad, also performed in local operettas. Later in the same decade, ̕Azîza Hilmî and Fâtima Sirrî became singing actresses, but like Munîra, were forgotten at the end of the 1930s.